This marinade is super quick to create and adds so much flavour to the chicken. I stumbled upon the idea of broccoli rice whilst browsing through the Hemsley & Hemsley cookbook. I have added in some kale, scallions and creme fraiche to bulk it up. Peas, spinach or thinly sliced leek would also work well. Add the lemon, orange juice, oil and water to a bowl. Cut the chicken breasts into thirds and add to the marinade. Cover and place in the fridge for at least 40 minutes. For the broccoli rice: chop the broccoli including the stalk into florets and coarsely grate with a food processor. Place the grated broccoli in a frying pan with 15 tablespoons water. Once the water begins to bubble, cover with a lid and allow to gently steam for 5 minutes. Roughly chop the kale and finely slice the scallions. Remove the pan from the heat and stir through the kale, scallions and creme fraiche. Cover with the lid and allow the kale and scallions to lightly cook. Pre-heat a pan on a high heat. Add the chicken to the pan, keeping some marinade aside. Cook the chicken through, remove from the heat and spoon over the remaining marinade. 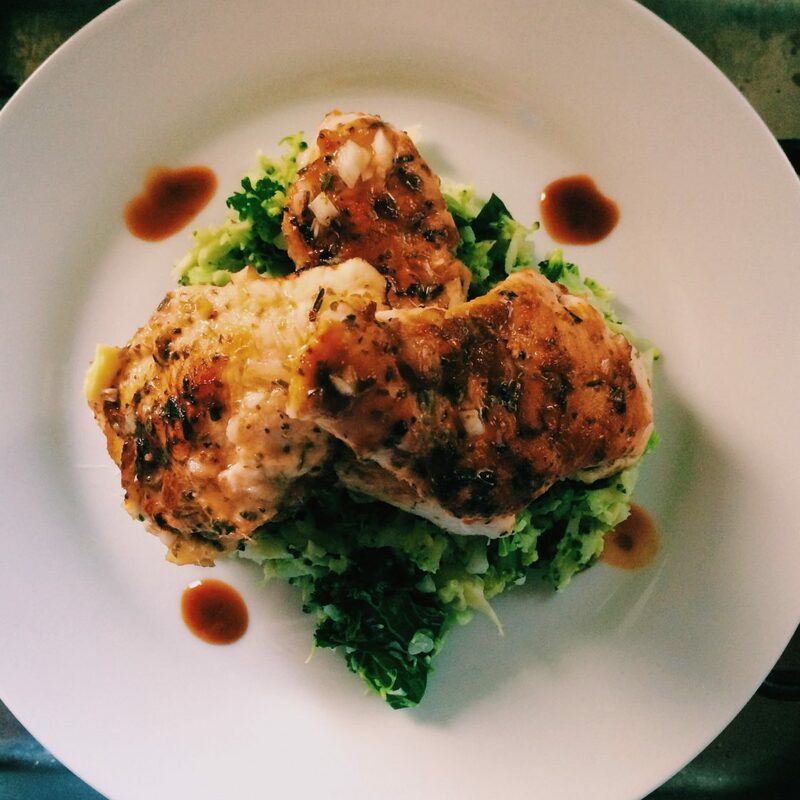 Serve the chicken on top of a bed of broccoli rice.